Additionally, unlike universal all weather floor mats, Husky All Weather Floor Mats will install perfectly every time and with ease since they are vehicle specific. Husky Liners come complete with their Sta-Put mounting system that holds the floor liners in place and keep them from shifting. Because Husky Floor Mats are made from highly durable thermoplastic, they will stand up to the weather and any additional beating you put them through. 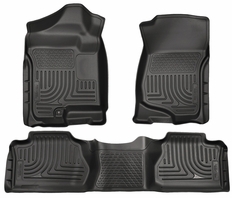 Sold as a set that will cover both sides of the front AND Back Seats, your Husky Floor Liners are backed by a lifetime warranty. You can rest assured that they�ll be hard at work for as long as you own your vehicle. 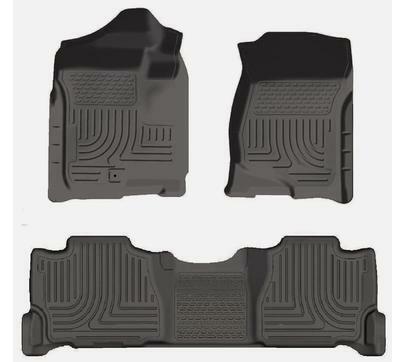 The part number for this item is 98261(Black) 98262(Grey) 98263(Tan) (depending on your color choice) and this PAIR of Front Floor Liners AND a Single Piece Back Seat Liner fits 2007-2014 Cadillac Escalade ESV, Chevy Avalanche, Chevy Suburban, Yukon XL Models.